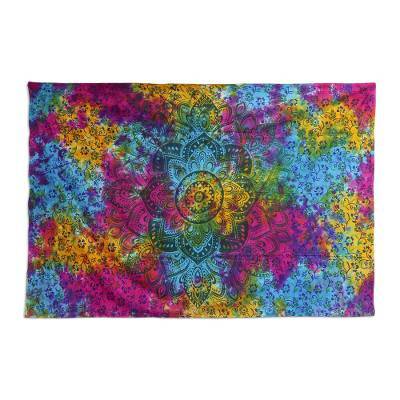 Rainbow Colored Cotton Mandala Wall Hanging from India, "Mandala Fusion"
An elegant mandala blossoms from the center of this magnificent cotton wall hanging from Indian artisan Osho Maharaja. The screen printed hanging features a beautiful array of tie-dyed colors that mingle together magically to create a vibrant accent to the home. Mandala is a Sanskrit word that means "circle".